Nobody's really sure when the Xperia Z4 will hit the market, but it seems quite likely that Sony will miss its promised 6-month refresh cycle, seeing as the Xperia Z3 was announced over 6 months ago, and its successor is still to make an appearance. We nevertheless have a few ideas as to what you should expect, but today isn't about that. Today, we talk Xperia Z4 concept renders. Now, much like concept cars that manufacturers regularly wow us with (only to disappoint later), smartphone concepts are usually a bit out there. Obviously, a fan artist doesn't really have to consider the many, many variables that go into the making of an actual, working device, and so has much more creative freedom. That said, it isn't at all uncommon for concept phones to look both great and technically feasible. We picked six of those. Unsurprisingly, the first concept we came across dreamed up an Xperia flagship device with tiny bezels all around. That's the exact opposite of the bezelicious Z1 and Z2, but not as much the Z3, which finally made things tolerable. Regardless, Sony's latest flagship is still plenty large, and we could never say not to some extra trimming. Curved displays are all the rage with some manufacturers right now, but that's not what this particular Xperia Z4 concept proposes. 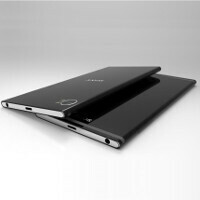 Instead, it paints a picture of an Xperia Z4 with a curvy back that fattens towards the middle and slims when approaching the top and bottom. Whether that's preferable to a more standard, horizontal curvature, we can't say. While most concepts focus on proposing new design approaches, we sometimes fall in love with the more standard-looking stuff. Made by Ashraf Amer, the renders gives us a white Xperia Z4 with buttons and ornamentation accented in gold. Sweet! Some concepts aim to break the mold and imagine a world where manufacturers weren't so dead set on going after recognizability for their phones. This is one of them. Granted, the concept does remind us a little bit of the OnePlus One, but defiance to the status-quo is something we can always get behind. This concept, reminiscent of a very thin Nokia N9, shows us a world where Sony, too, has access to displays that curve to the sides, Samsung Galaxy S6 edge style. Another Jermaine Smit concept, this one shows us a Huawei P7-like, super-thin construction for the Xperia Z4, seemingly made out of metal and glass. Numbers 5 and 6 look great. It would be nice if they really changed it up like SS this year. Still waiting on that compact version though. Change it up like SS? Really? Sony has been producing premium phones for some considerable time and metal chassis with glass on the front and back for quite a while..... Sony simply needs to improve the design of the Z3 (marginally as not a lot wrong with the Z3), ensure its software is optimised, especially in the camera dept and market the hell out of the thing.......! Marketing is one area where Sony needs to really take a leaf out of Samsung's book..! Yeah, the last two looks great. While the ultra attracts me for the thin bezels, its very unlikely Sony will narrow the bezels upto such extent, considering their track record. IMO concepts kill the appeal of devices. The guys who make concepts have no idea how difficult it is to manufacture them and pack real tech stuff in it. Concepts always look great. Do you think people who actually work in these companies can't think of these concepts? No, that's not true. Real life is much more difficult. What happens is like this. Someone makes a cool render -> People keep saying how great it is -> Fanboys go all mad and start promoting the new phone which looks great -> the real product looks much worse than the beautiful render -> people get mad and curse/bash the device for something which was someone's imagination at best. The same happened with M9. M9 looks great but all people got disappointed as that Evleaks render looked better. Something's wrong with what you've just stated. M9 looks great, but because it looks just the same as m7 and m8, people gone really wild. Evleaks render isnt something difficult or will cause any engineering problem. It may be difficult but not impossible. I agree with all of the things you said above.. but, I do not agree with the last part.. I haven't seen evleaks renders, and I find M9 unattractive,, may be because I have been seeing the same design for the last two years now. I think they also needed an overall changed, they may have come up with a better and different design with thinner bezels. Sony doesn't need to make any major changes, just shrink the size of there bezels and stay away from Qualcomm they will be good. They can't do that, there's no alternative currently on the market. If the Z4 Ultra in picture #1 is real, then instant buy for me. A big congratulations to Sony for losing the massive top and bottom bezels, looks really elegant now, much more attractive. What took them so long? Z3 has pretty small bezels, they just look big because of squareish size. This is where looks precedes function. "hey u guys look at my super thin phone isn't it the greatest?!?! Its just so aesthetically pleasing. It only last 5 minutes on battery power and overheats because its razor thin, but its so space-age and hip so its TOTALLY WORTH IT"
I'll take a #6 please in black!